We met earlier this month and it was our second activity in the compost bin project. The first one was our visit to Anphu Earthworm Farm in Cu Chi. After the trip, we learnt that his earthworm didn’t suit our compost bin and Hoang-Anh, co-founder of the FabLab, has been looking for a new way to do it. Fortunately, she met Khue Vo who has been successful with his research of using Black Soldier Flies in composting. Veggie Tower: The Tower is made from a modified plastic big can. One tower can hosts up to 50 plots for plants. Khue has many different shapes of the tower for different need of each household. He can also make custom ones based on the current material available at your house. Compost bin: Black Soldier Fly Larva (Larva) will process the left over food. The benefit of using larvae is that they can not only eat vegetable but also meat. And they do it faster in comparison to earthworms. A small compost bin can be used for a family of 4 people. This is the main point of the talk. About the Black Soldier Fly research, Khue has been into it for several months now and gained indept knowledge about the subject. Aside from reading online sources, he also contacted an expert who has been raising the Black Soldier Fly as a pure hobby for 2 years. Fablab Saigon is planning to visit the farm in near future, so stay tuned. Khue started the talk by emphasizing the self-balance of nature, that each species has specific roles, and Black Soldier Fly is a great example. They are cleaner of the world by processing the dead animals and left over vegetables. Their dung will be used to feed the earthworms living in the Veggie Tower. Moreover, the matured larvae can be used as nutritous animal food to chicken, pet reptile, etc. How about human? “They (Larves) are what you feed them.”, if you feed them with clean food (not garbage) then you can even eat the larvae. In some supermarkets in the US, frozen larvae are being sold as human food. Khue himself has fed the larvas with banana only with the hope that he can enjoy them one day (and share with his friends at Fablab Saigon of course). Black Soldier Larvae are more suitable for Compost Bin because they process the waste faster than Earthworms. Moreover, Earthworms can only eat vegetable being dissolved by heat and earth. 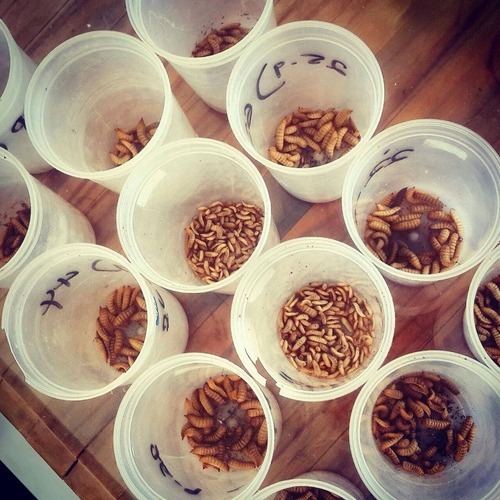 We must separate Black Soldier Larvae from earthworms because they live in different environment; Earthworms live in non-acid places while the larvae, by nature, produce a lot of acid. Earthworms’ dung is a better fertilizer for plants. Meanwhile, larvae’s dung is a great food for the worms. Khue’s current business is to provide the veggie tower and the service that comes with it. Each month, he will come and plant new seeds/baby plants into the tower as the old ones are harvested. 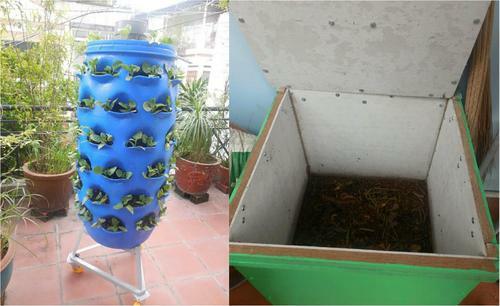 The compost bin is more like a supplementary product for those who have the veggie tower or plant trees. It’s more like a hobby of living green if being used in household. As a normal family will have no use of the matured larvae, he plans to come and collect the larvae at the same time the veggie tower needs to be refilled. And he then can sell the larvae as animal food. There’re already good responses from the pet shops he visited. As his family doesn’t allow him to research at home, Khue’s lab will be relocated to FabLab Saigon so if you want to meet him, hit the lab. If lucky, he will serve you the larvae! This entry was posted in Projects and tagged blacksoldierfly, compost, vermicomposting. Bookmark the permalink.